1. The reducing hydrant valve is served at a higher floor in the tall building. The water pressure of hose nozzle in a higher floor is usually over 7 kgf/cm2 The reducing design is to protect the nozzle pressure constant in 7 kgf/cm2 which is construct as a orifice and coilspring to adjust the water ressure. 2. 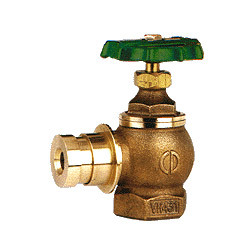 The valve is made and test in accordance with CNS 13579. Material body cast bronze JISH5111 BC/ASTM B584 C83600, hand wheel aluminium alloy die casting ASTM B85 A413.0 i,e, JIS H5302 ADC 1. AVH 401F 1 1/2 PT thread female inlet with 1 1/2 Quick connector male outlet, working pressure 16kgf/cm2 test pressure 32kgf/cm2.